That book doesn't appear to be in our database. 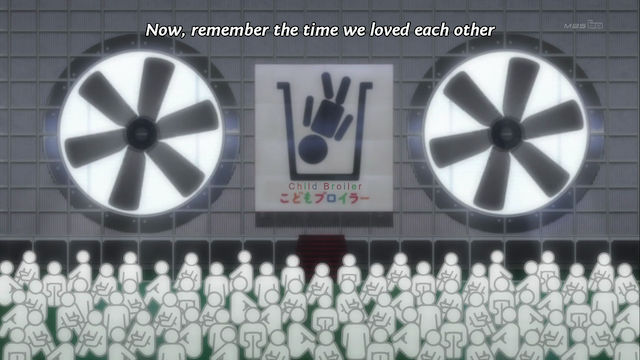 Welcome to the most brilliant and disturbing episode of Mawaru PenguinDrum yet! While surreal, and denying easy resolution to a specific meaning, episode 9 has added weight to theories that tie the story to the 1995 Aum Shinrikyo sarin attacks. We also learn the shocking identities of the two other women shown with Himari in the ED. 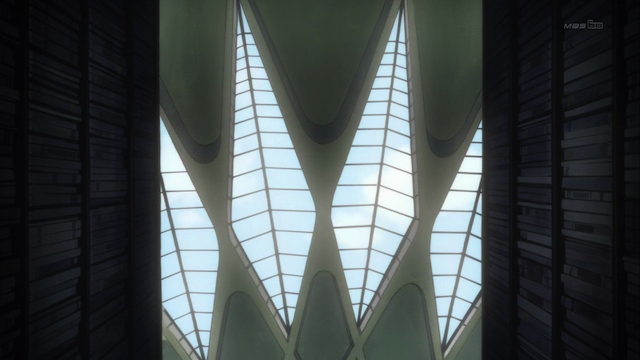 Truthfully this episode is packed with imagery that seems to demand meaning, without providing it. Sanetoshi, Head Librarian of the Hole in the Sky annex. When Himari can’t locate Super Frog Saves Tokyo, her penguin leads her through a mysterious door, and further down, into the Hole in the Sky annex. There she finds books like, Super Frog Saves Professor Azumah, although I doubt he really needs saving, and the head librarian, Sanetoshi. Sanetoshi helps her find the story she is looking for, which really is her own memory. He reads stories out of different books that are pieces of her relationship to the other two women in the ED. As it turns out, Himari once planned to start an idol group, called Triple-H, with her school chums, Hibari and Hikari. Triple-H. The mystery of the ED is finally revealed! I had assumed that the other two girls shown in the ED were gender-bent versions of Himari’s brothers, Kanba and Shouma, because they have the same hair colors. As it turns out, just as they were preparing to submit a video to a contest, disaster struck. Himari was throwing a tantrum, and, as Sanetoshi puts it, “her selfishness scarred her mother for life”. 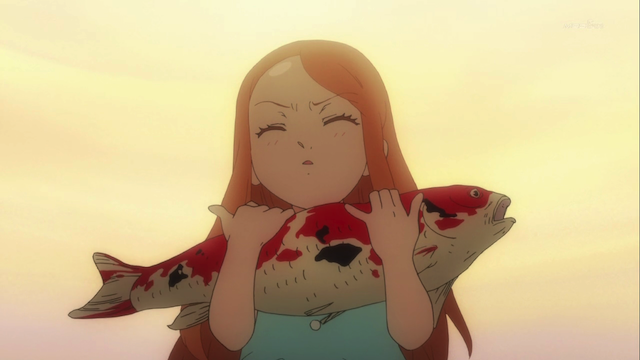 The most horrifying section of the episode: a young Himari prepares to club a koi to death, so her mother can drink its fresh blood. Some things are best left unsaid. Suffice to say that her friends stick with her through her troubles. How they come up with the idea of drinking fresh koi blood is kind of horrifying in itself. The idea comes from reading Barefoot Gen, a manga about a boy and his mother trying to survive the aftermath of the atomic destruction of Hiroshima. Kunihiko Ikuhara is digging into some dark stuff here, and pairing it with after the earthquake is a way of referencing some of the most notorious disasters to strike Japan (prior to the current situation, with the tsunami and nuclear disaster of this year). As frivolous (to say nothing of deranged) as Ringo’s story has seemed over these past few weeks, Himari’s “survival strategy”, whatever it is, seems to be far more serious. Double-H: Shocking revelations of the ED part 2! 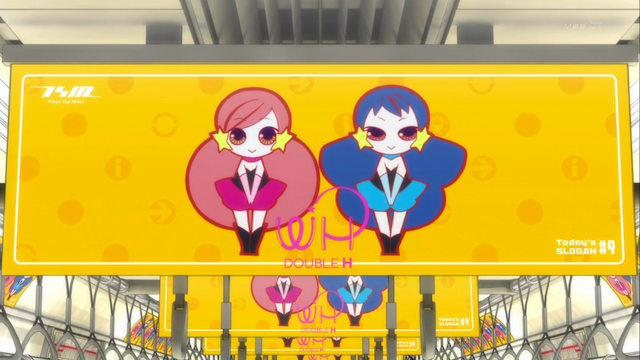 Apparently, when Himari got too sick to go to school any more, her friends Hibari and Hikari continued to act as an idol group, under the name Double-H, and their characters have been used in every episode as the public service announcements! Seeing these characters has become a familiar part of EVERY episode, so it is easy to imagine that Himari is constantly having to face a reminder that the illness she suffered from robbed her of her dream of becoming an idol. 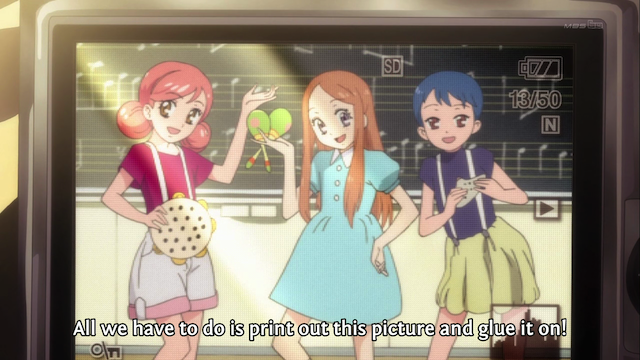 This was a major overhaul of Himari’s character. We got to see her selfish, losing her dream (and her friends), and rising above her misfortune in the end. She tells Sanatoshi that she wanted to find these memories so she could be sure they are in the past, not to wallow in self-pity. Sanatoshi then proceeds to give Himari the Emperor Penguin cap, and declares her the bride of fate. Pingroup logo underneath the sticker ?? 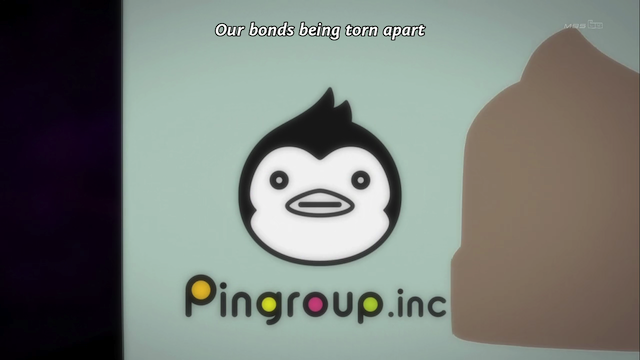 I don’t know what this means, but the box that the penguins were shipped in was labelled with this Pingroup logo, but the logo had been covered by the Penguin Force logo. Now that makes THREE logos (including the Kiga logo, which was on all of the books, and the money envelope that Kanba receives). Are they implying that all of these companies are the same? What is this? A bomb shelter? And what the hell is a "child broiler"? I understand this even less. WTH? “Child Broiler”? And for context, as this is shown, Himari is remembering that she has a soul-mate with whom she has shared (or promised to share) the “fruit of fate”. And after this Himari wakes as if this was all a dream, and finds out that Shou has been injured. Fascinating. Perplexing. Mysterious. Disturbing. 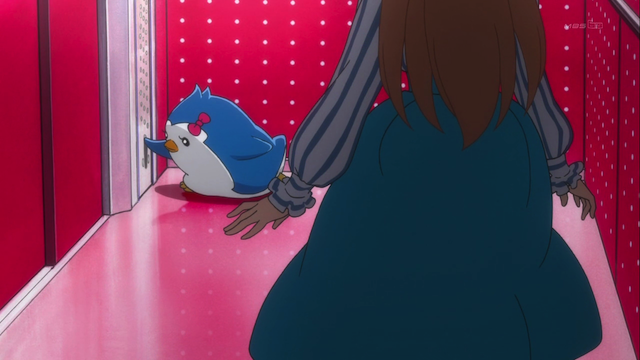 This episode of Mawaru Penguindrum was extraordinary — even by PenguinDrum standards. Oh wow, I did not notice the two girls in the ED or the train were the same friends. Keen eye. I know. This is the kind of show that you always feel has a lot more going on than you realized at first. 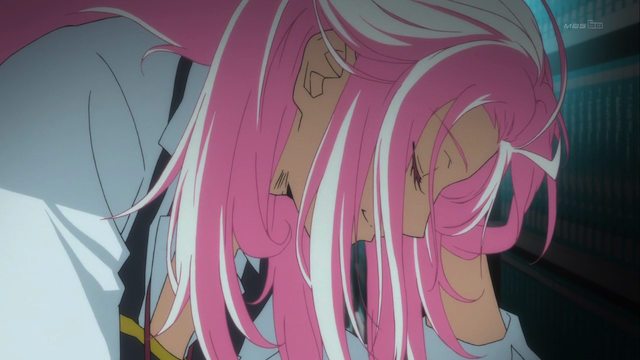 I agree, this episode was extraordinary, I am sure the rest of Penguindrum building up to this episode might have had something to do with, but even just as a standalone episode, this was one well made episode. I have a horrible memory so I was convinced that the pink girl was the mysterious ball using sniper, I was also trying to tell if Ringo (whose name and hair colour I had forgotten) was actually the blue haired idol, darn, I can be a bit silly at times. Yeah, a great episode in a great series. And, yes, it has been a good week in anime, hasn’t it? Not a happy-happy week, but lots of powerful and well-crafted episodes. I was also confused on the logo changes. I only thought that the black one’s for the villains, and the white’s some popular brand in the show’s setting, haha. 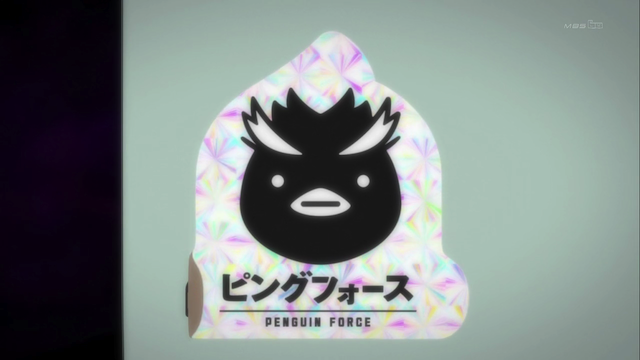 Hmmm… Penguin Force and Pingroup are such… mysterious companies, ahaha. If the books Sanetoshi has been picking up for Himari has connection to her past… then perhaps the actual book she’s looking for has something to do with the future… saves Tokyo eh… I imagine alien penguins invading the Earth and the Takakura siblings saving everyone. That’s… so lame. Haha, I don’t think the series would end up as something like that. Yeah, at this point I am very unsure if they are suggesting that there are multiple organizations using humans as pawns in their supernatural game, or that there is one organization, pretending to be multiple organizations because they just like to cause trouble for the humans.